At this time of year, we all need a bit more space. Polytunnels are packed, sheds are full, and there isn’t enough room in the greenhouse to shake a poppy head. Our precious seedlings have become strong young plants, and while it’s a welcome sight, it’s also causing storage issues. Thankfully, since the recent frost wiped out my tomatoes, the temperature has been on the rise. As a creature of habit, I tend not to plant out until the second week of May. 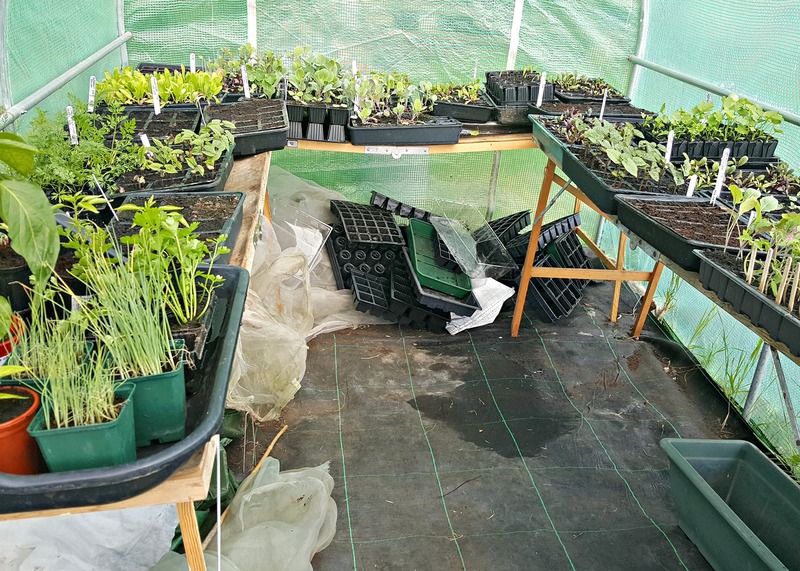 So for some plants, this weekend they were packing up and moving out into their final planting positions on the allotment. Getting out the bean poles to create bamboo works of art is something I enjoy. Not only do I try to differ the designs every year (I’m an artist darling, and I need to fulfill my creative yearnings), it’s the time when I feel that summer is just round the corner. This year, I’ve designed them to arch over a path. 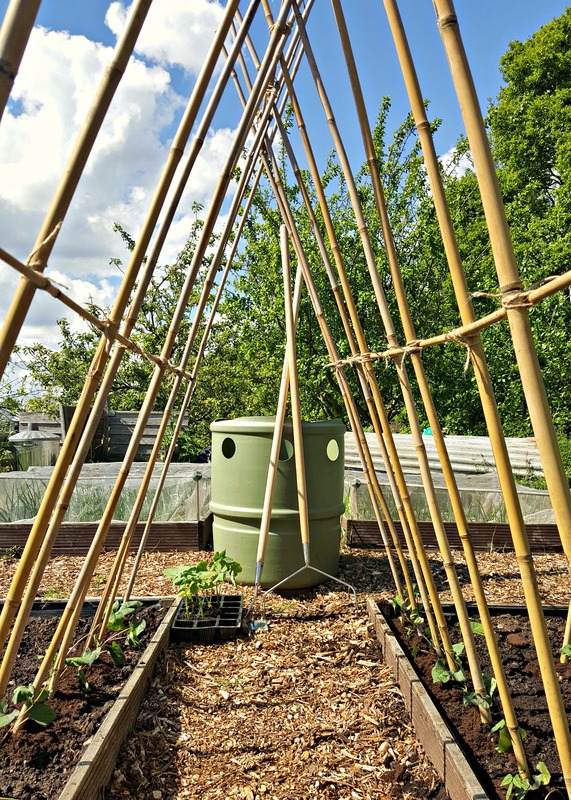 Not only will it save space and look pleasing to the eye, the pods will be easier to pick and hopefully with greater ventilation, black fly won’t be so keen to attach themselves to my harvest. After last year’s runner bean glut, I’ve decided not to grow any this year. Even now, I couldn’t stomach eating another runner bean! 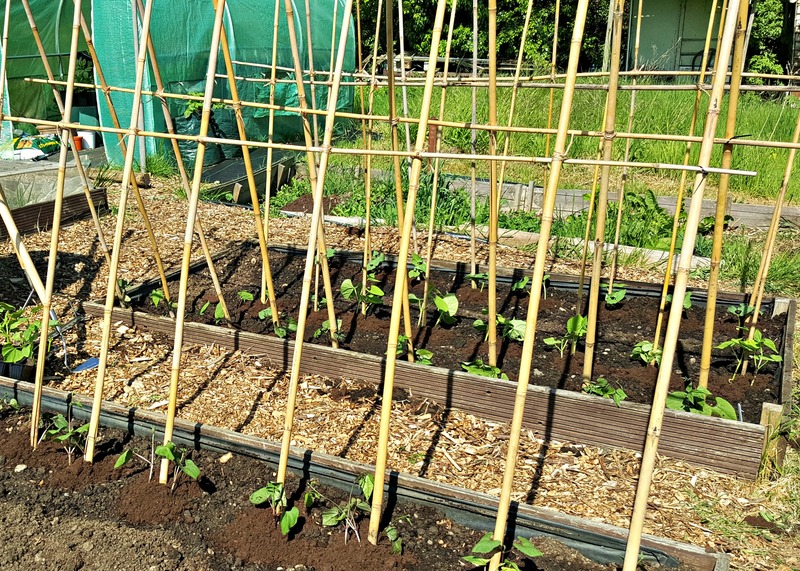 However, I’m making up for it by growing both borlotti beans and a climbing purple french bean variety. Another vegetable to suffer my polytunnel tyranny was my third and final batch of peas – out they went! So far this year, I’ve tried to stagger the pea growth. I have two varieties on the go, the attractive purple podded Blauwschokker and Hurst Green Shaft. I grew them in root trainers in the polytunnel before planting them out. Again, to save on space, I’m using simple chicken wire attached to canes. The final veg to be evicted from the polytunnel were the brassicas. Marathon broccoli, Broccoli Romanesco, Duncan Cabbage and Cauliflower White were out. Their beds were primed with last winter’s rotted manure. This black gold is not to be sniffed at; with various skirmishes at ‘Pooh Corner’ and run-ins with the old boys, it had cost me greatly. At times ‘Pooh Corner’ had looked more like a battlefield from Game of Thrones, and the massing army of wheelbarrows, and the grumblings of aged allotmenteers, still fill my nightmares to this day. 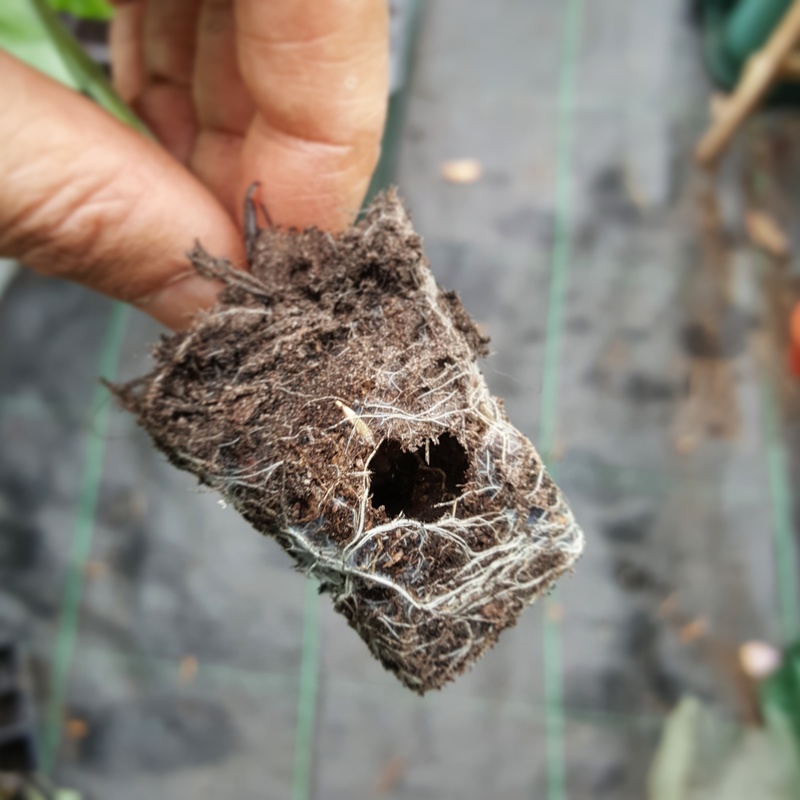 In all, the move had gone well, despite a horde of warring ants raiding my polytunnel, and burrowing their way through several of my Romanescos. My polytunnel eviction list for next weekend includes beetroot, celery and sweetcorn. 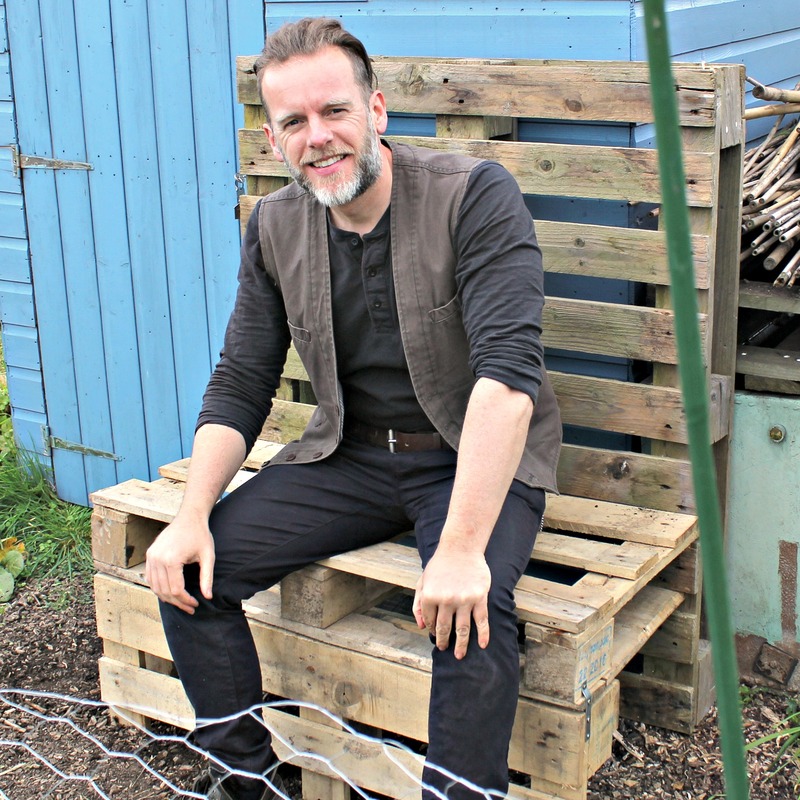 For now though, I shall take stock upon my Iron Throne (which I up upcycled from pallets a few weeks ago), and survey my kingdom. Right now, it doesn’t look half bad. Reading Agent Ade’s exploits on the allotment, and knowing how hard he works, I declare that he HAS to be the best dressed on the Lot. I don’t know how he does it, but he always manages to look so dapper! I was interested to see the bean poles arched over the path. I now push the bamboos in at a steep angle so that the opposite canes cross fairly low down, rather than near the top of the canes. Again my logic is that this makes the beans easier to see and pick.